I know that a number of you have been waiting for the Breyer 2019 Stablemate Club enrollment to open and enrollment is officially open! This beautiful glossy Mirado model was featured in Breyer’s promotional email and I’m fairly certain that he will be a Breyer 2019 Stablemate Club Special Run. I personally was not overly fond of the grulla pinto Mirado but I do like this chestnut! 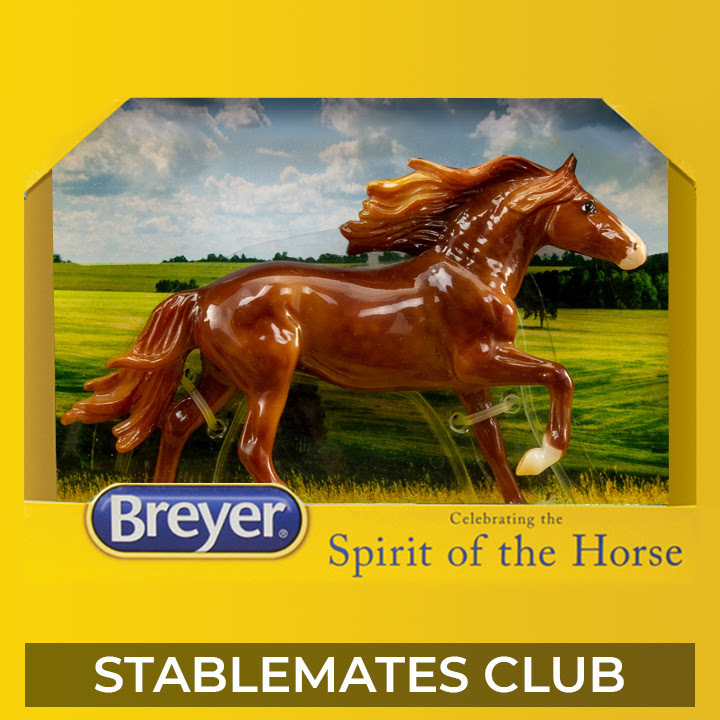 If you find Breyer’s Stablemates impossible to resist, then the Breyer Stablemates Club is for you! These small wonders are hand-crafted with great detail and their decorations share the finesse of their larger Traditional counterparts! You must be a 2019 Collector Club member to access the buy box. Once you have purchased the club, you will no longer have access to the buy box. (6) new members-only Stablemates Club models in beautiful colors exclusively designed for the club. Each model is packaged in a miniature version of Breyer’s iconic yellow window box. A brand-new Stablemates sculpture will debut each year in the Club! All Stablemates Club members are eligible to be entered into a raffle for a unique collectible! Each model is only $20, and is shipped to your home in a miniature Traditional-style window box. To join, you must have a valid 2019 Collector Club membership and sign up by December 31, 2018with a non-refundable deposit of $30. We’ll deduct $5 from each model when it ships, so you pay $15 per model (plus S&H). This program is a continuity club which means you are obligated to purchase all six models. First Shipment for US members is in February 2019, with subsequent shipments every other month.